Create Embellish Adore: Peek- a-boo, I see you. Underwear? Peek- a-boo, I see you. Underwear? I couldn't gobble down dinner fast enough last night to sketch this down. I know it may seem alittle ... well... odd. Please note that I have two teens.. and with them comes the most interesting topics of conversation. Some times you have to take their word as ... just that their word! .. We discussed Valentines, and of course we have some great chocolate lovers in the house - but then my son says, Can I get more boxers? 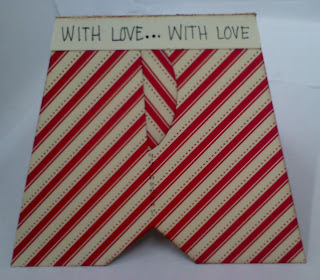 ...like out of nowhere... so here are his boxers... LOL.. for his valentine gift! Of course I might just make him 4 of them, and box them up and then hide the "real" ones for him to find-- like a treasure hunt. This actually my little demo, but since I knew there was a new Greys on I had to hurry.. but I like the turn out. Merry Moments DSP, vanilla CS with black marker. EDITED 2/2/2010: I finally was able to sit and complete instructions for these little guys. Please send me an email at greetingsbychera@yahoo.com for them! Thank you again!! Oh my gosh !!!!!! This is hilarious !!!! DEFINITELY going to be casing this :) !! hot stuff! really funny to look at, let alone receive..TFS! Those are super cute! I might have to CASE those. My mom always buys the kids socks and underwear for gifts. You always need them. WoW! what a very clever idea, they look just like the real ones. a priceless moment for you when he receives your card. love your treasure hunt idea.